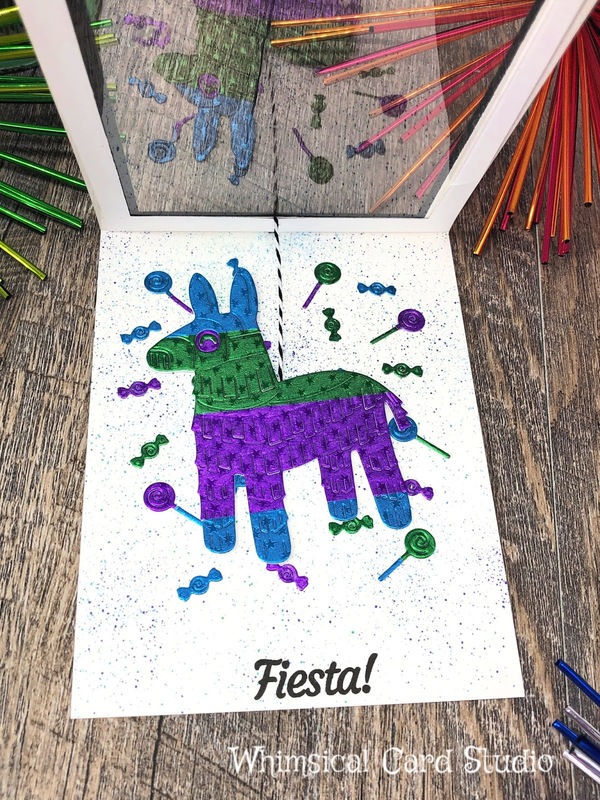 I've created a fun interactive card with a festive piñata theme and I've written a comprehensive step by step tutorial with photos. · Trim the copy paper around the foil so it will fit into the die cutting machine. 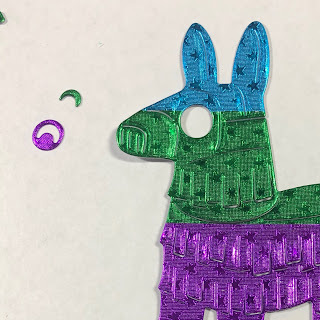 · Before using up all the leftover foil, die cut the “eye” of the donkey from the purple and green foil, which cuts two separate pieces. One part looks like a little moon (as you can see in the picture below). You could discard the little moon shaped piece - I chose to use both. 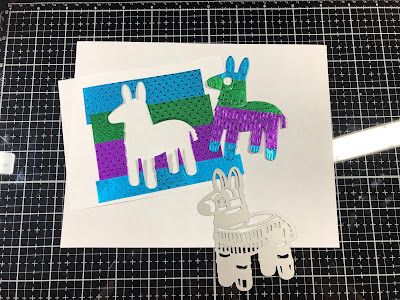 · cut a small piece of copy paper and tape (ordinary scotch tape) on the back side of the donkey die cut so there is something to glue the eye die cut pieces on. · Put some liquid adhesive onto the eye area (where you see the copy paper from the front) and place the eye die cut pieces. · Prep the card base plus black cardstock as shown below – the black piece of cardstock is laying on top of the bottom half of the white, temporarily taped so that it stays aligned with the edges. Place the smaller (3 ¼” x 4 ½ ”) rectangle die in the middle, leaving equal space around all sides. Using a ruler is best to ensure the placement is correct unless you are very confident with eyeballing it. · Die cut the assembled piece – you may need to run through a few times or add an additional shim depending on your die cutting machine. You will be left with a window in the center of the white card base. Save the outer frame of the black cardstock for the next step. 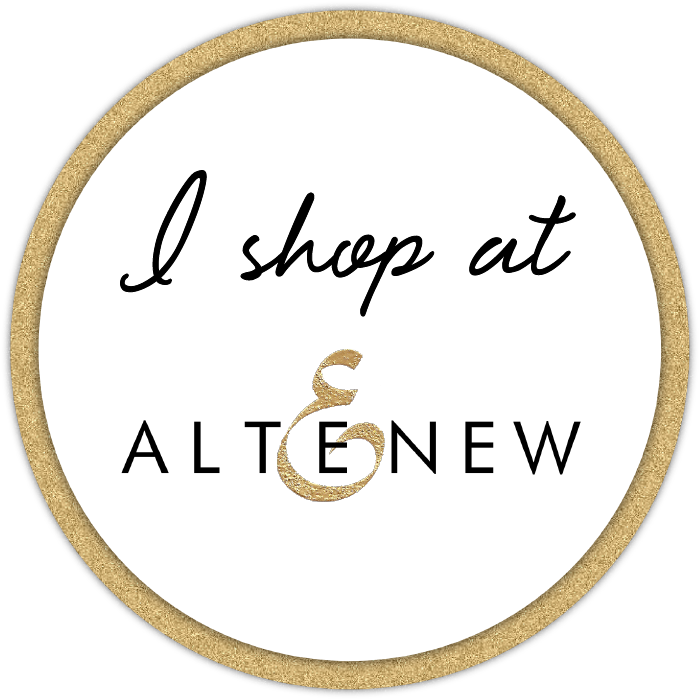 · Take the black cardstock frame and place the larger (4” x 5¼”) rectangle die on it so you will have a thinner frame after die cutting it. Save for assembly of card. 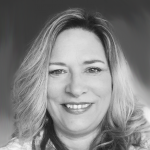 · Pull off part of the backing so only a small portion of the adhesive is exposed, which will help you align the acetate easier. By placing the acetate first on the non-exposed adhesive, you can adjust the position then press down in the corners where the adhesive is exposed. It’s easy to then pull away the backing from underneath the acetate and press down as it is removed. · Now it’s time to add the donkey to the top of the frame. The twine should be taped to the center, allowing enough room for the donkey to be positioned in the center of the window when closed. It may take a few adjustments to get this where you want it. · Cover the adhesive on the inside of the card die cut another piece of white cardstock (can be the same white cardstock or a lighter weight from your stash) starting at 4 ¼” x 5 ½” and die cutting out the same size window with the smaller rectangle die, then glue over top of the acetate with scor-tape, creating a sandwich that the acetate and twine is sitting between. You can then trim off any excess twine outside the frame. The picture shows what this looks like from the inside of the card at this stage. The “pretty” part of the piñata will be visible through the front of the card and swing freely when the card is opened. this also shows what the inside looks like by the completion of Part 4. 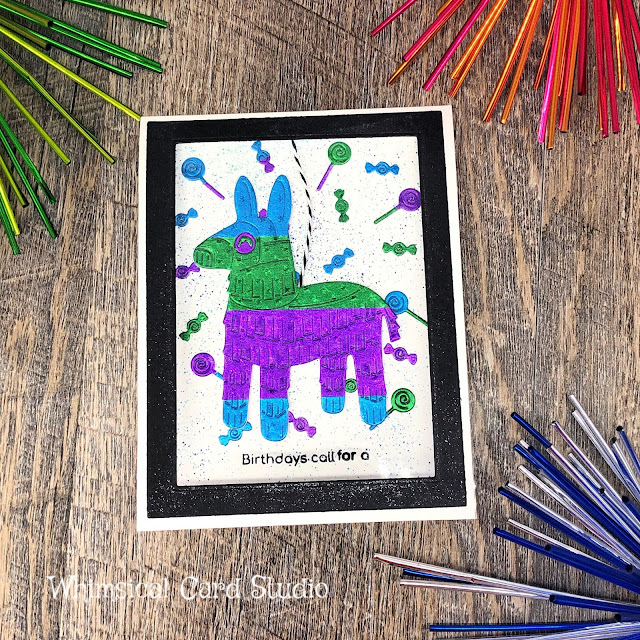 · Pre-arrange and glue all the candy die cuts on the inside panel of the card base so when you are looking at the card you will see them behind the donkey. Note the picture below shows the arrangement before I had added the swinging pinata in the prior step. You could do this in either order as it doesn’t make a difference. o Tip: tweezers or a tiny bit of low tack tape can be very helpful in picking up the tiny pieces and adding glue. · Fold card base and reinforce fold with bone folder. o Tip: use of a stamping positioning tool like the MISTI is highly recommended if you have one, as it allows you to stamp more than once if the first impression is not good. 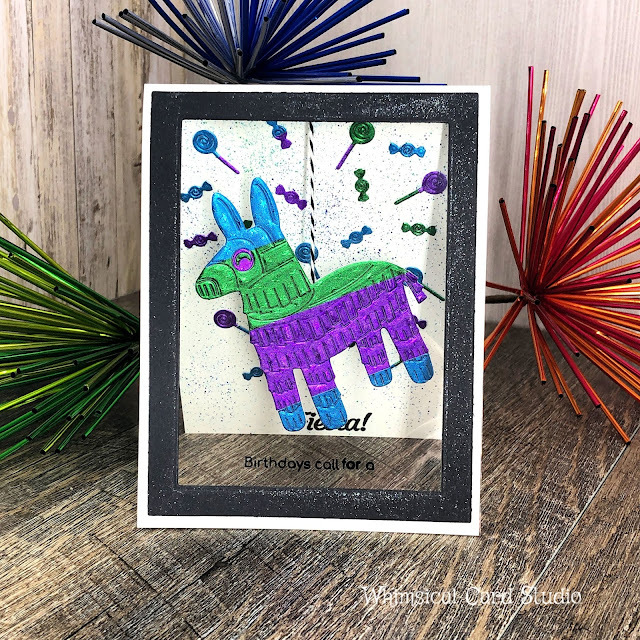 · For the word “Fiesta”, stamp on the bottom inside of the card (Versafine Black Ink) where it will only be visible when the card is opened. Based on the exact supplies I used, you have about ½” at the very bottom to get this result. · As a final touch for the inside I used a marker spritzer and the three Tombow markers to add more interest to the background. You could also splatter with coordinating ink if you prefer. · Another touch for the plain black frame on the front is to add some glimmer using the Spectrum Noir sparkle marker (optional but really does make a big difference).